This Year MPS Building & Electrical is providing a fixed price Summer Start Up Air Conditioner package. 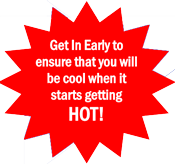 Get in early for the 2015 – 2016 Summer Start Up Air Conditioner Service Special. MPS can also install new or additional air conditioning systems for your home.